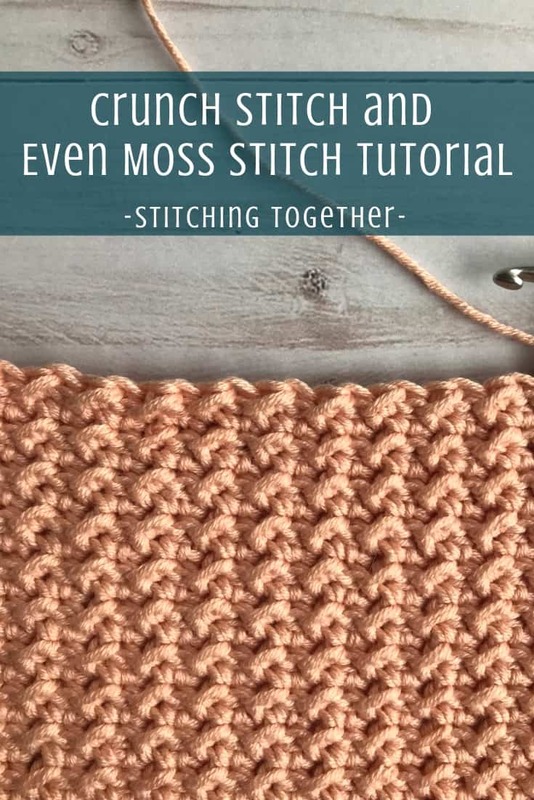 Have you noticed that sometimes the EXACT same stitch will have a different name, or in the case of the crochet moss stitch, many different names? 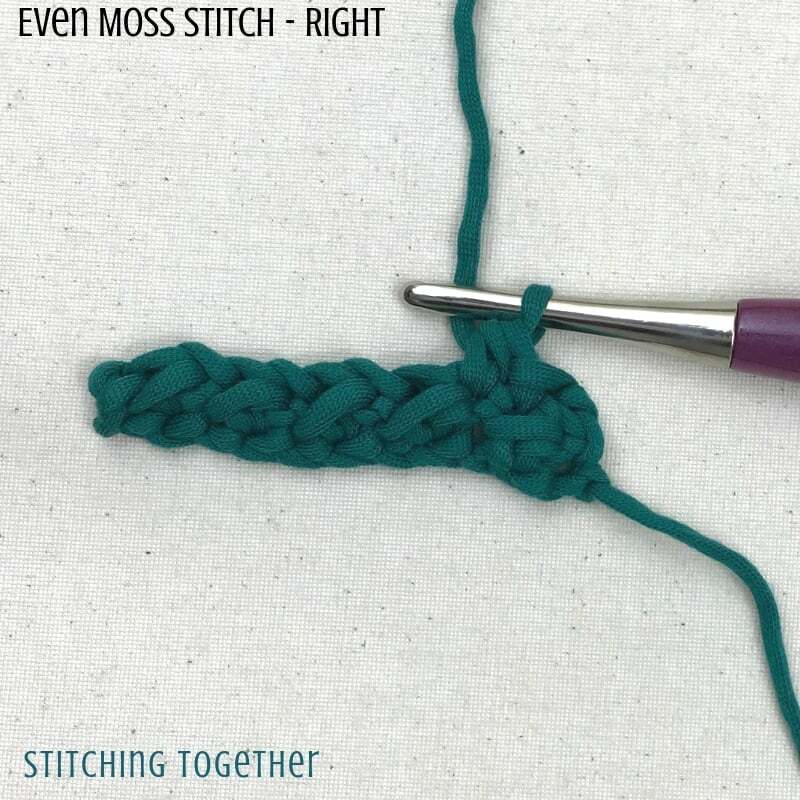 The Crunch Stitch and the Even Moss Stitch almost fall into this category. 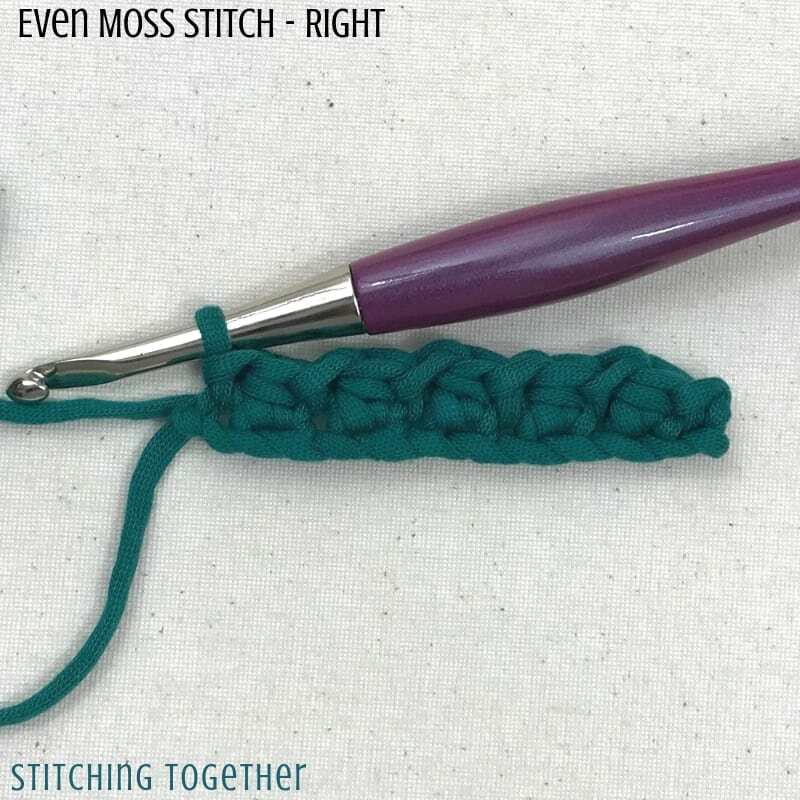 They are practically the same stitch and look almost identical when worked up. 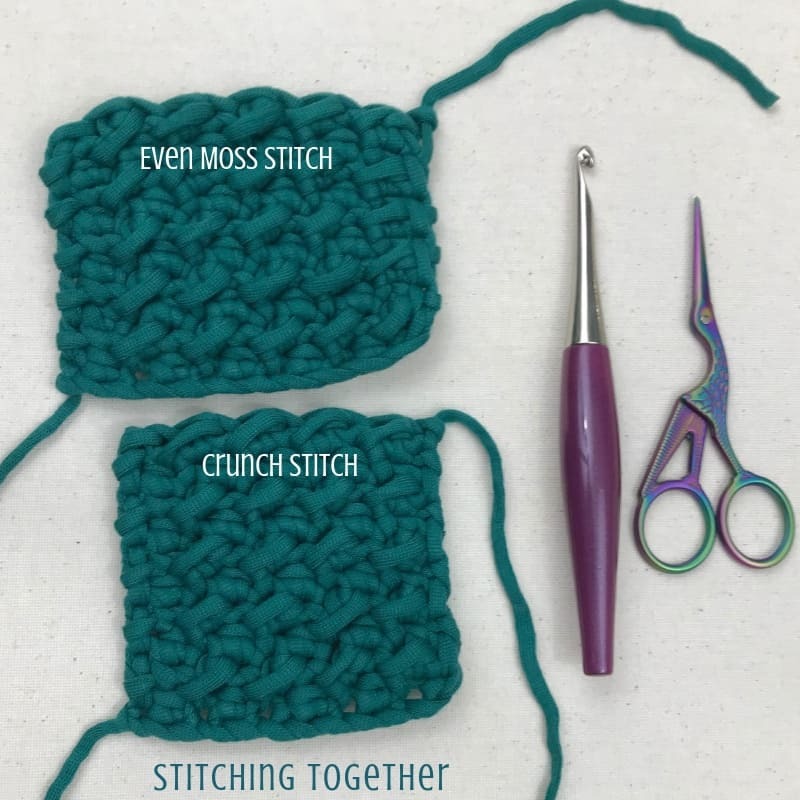 What’s the difference between the Even Moss Stitch and the Crunch Stitch? 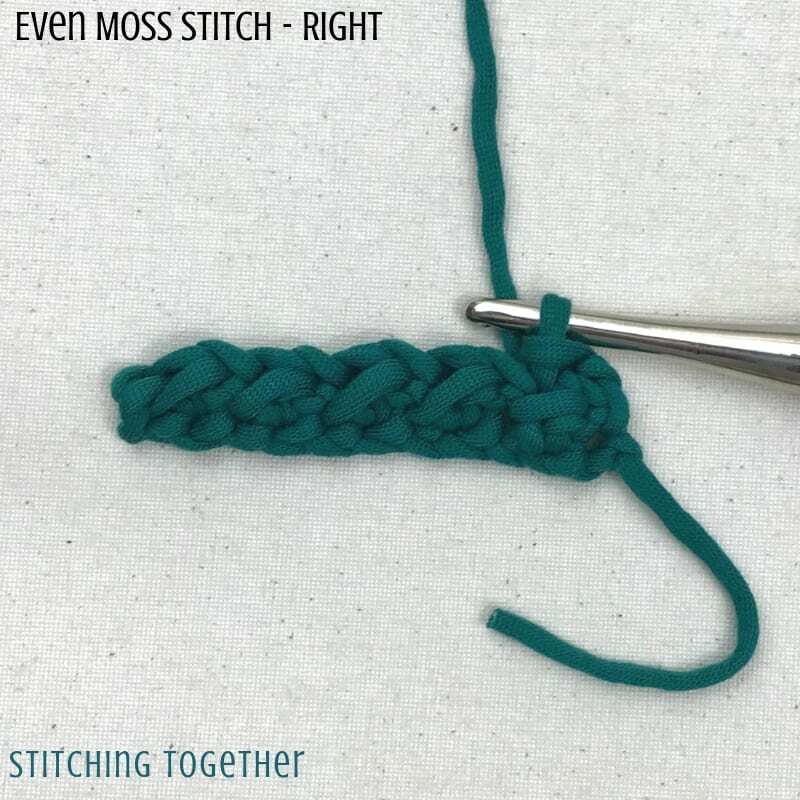 The Even Moss Stitch starts each row with a chain 1 and ends with a slip stitch in that chain 1 from the previous row. 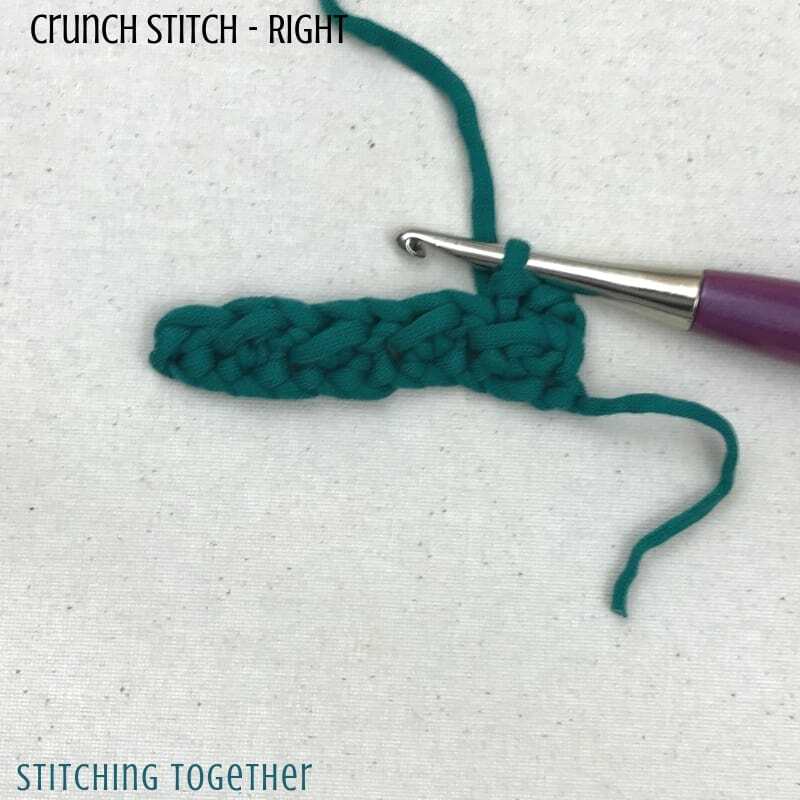 Whereas the Crunch Stitch starts with a chain 2, which counts as a half double crochet and ends with a slip stitch in the top of the chain 2 from the previous row. 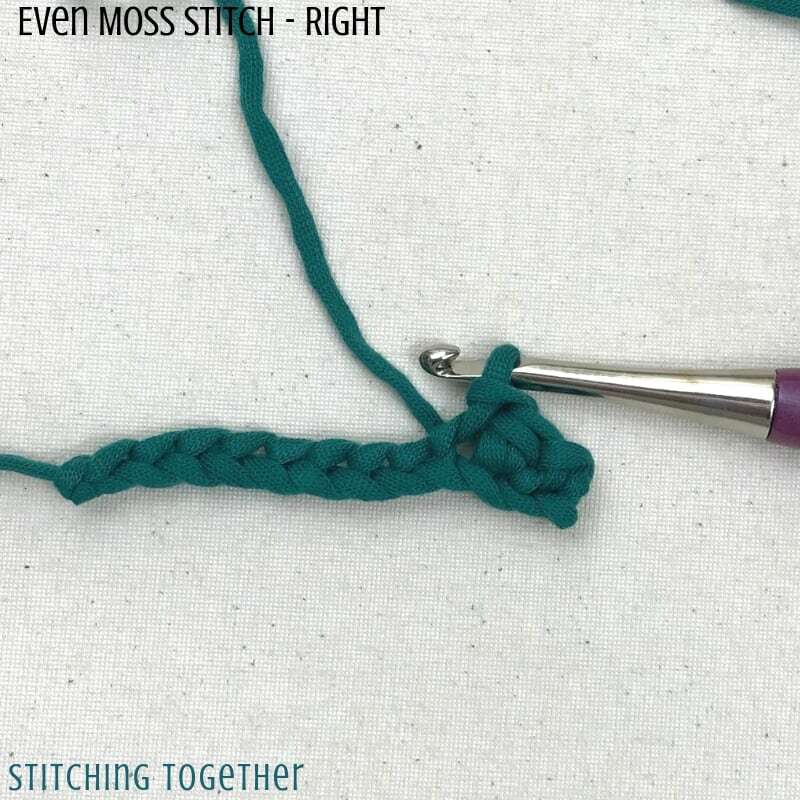 The edges actually look very similar between the two variations, but the starting row and the ending row of the Even Moss Stitch seem to pull in a bit. 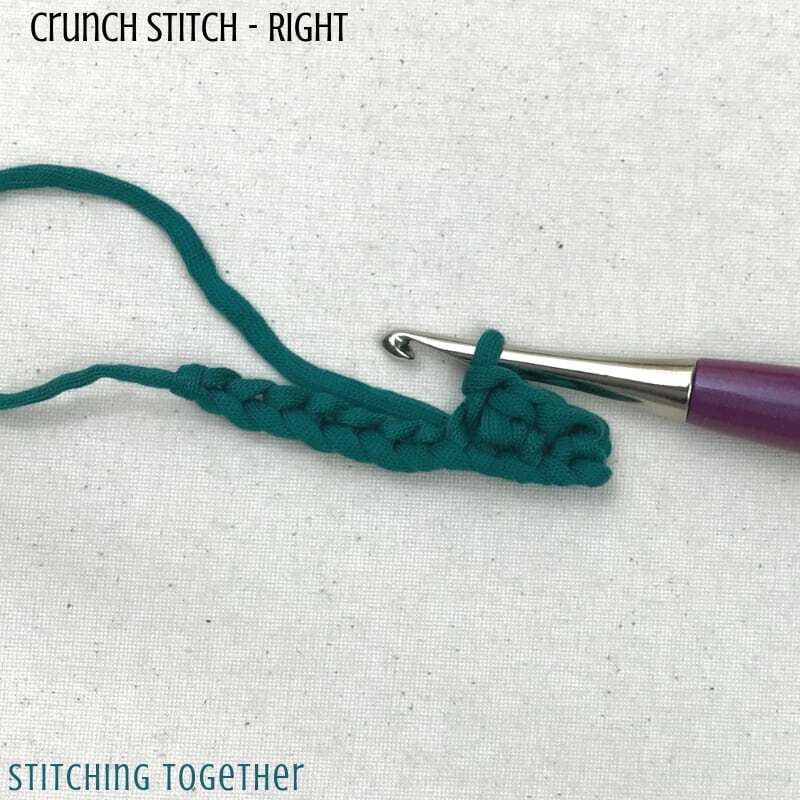 Since you are only chaining one at the beginning of the row and then skipping that stitch, your yarn pulls in more than it does with the chain 2 of the Crunch Stitch. 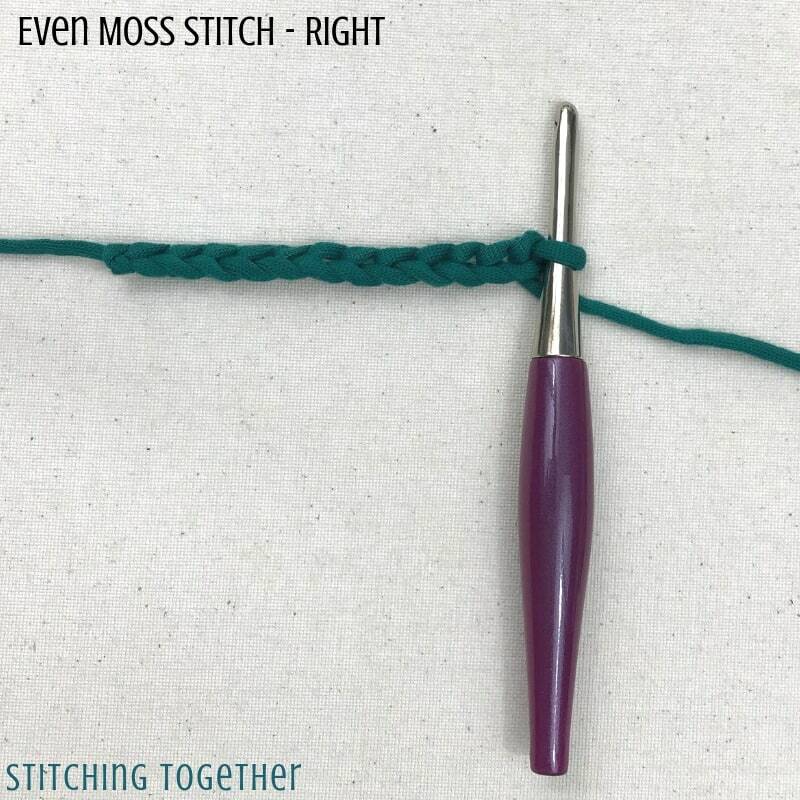 Once you’ve practiced both of them, you can decide which you like better and can easily adapt a pattern to use the one you favor. 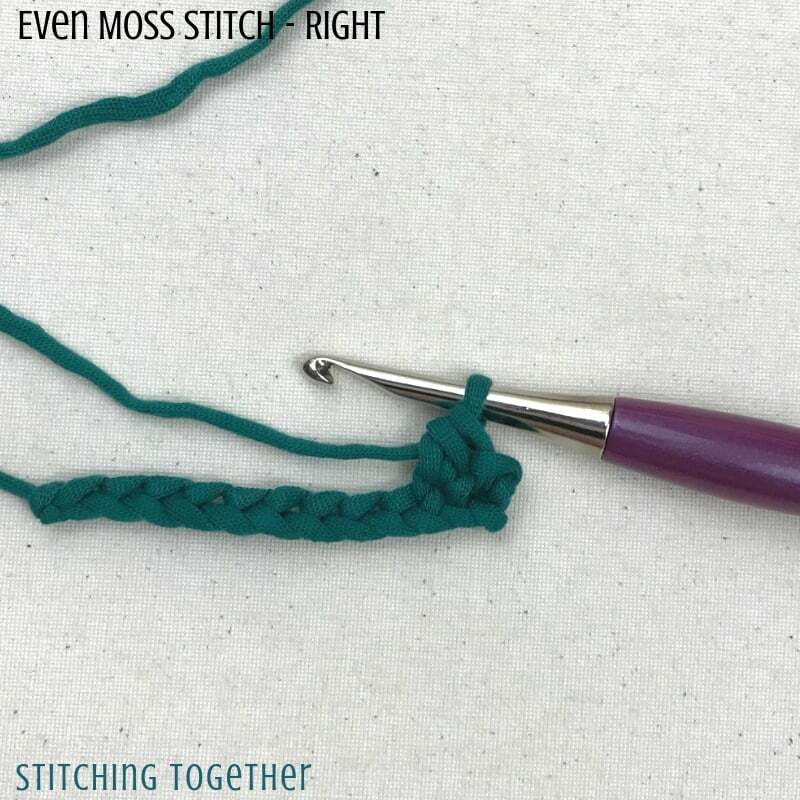 The Crunch Stitch starts with one more chain than the Even Moss Stitch, so you will want to keep that in mind. 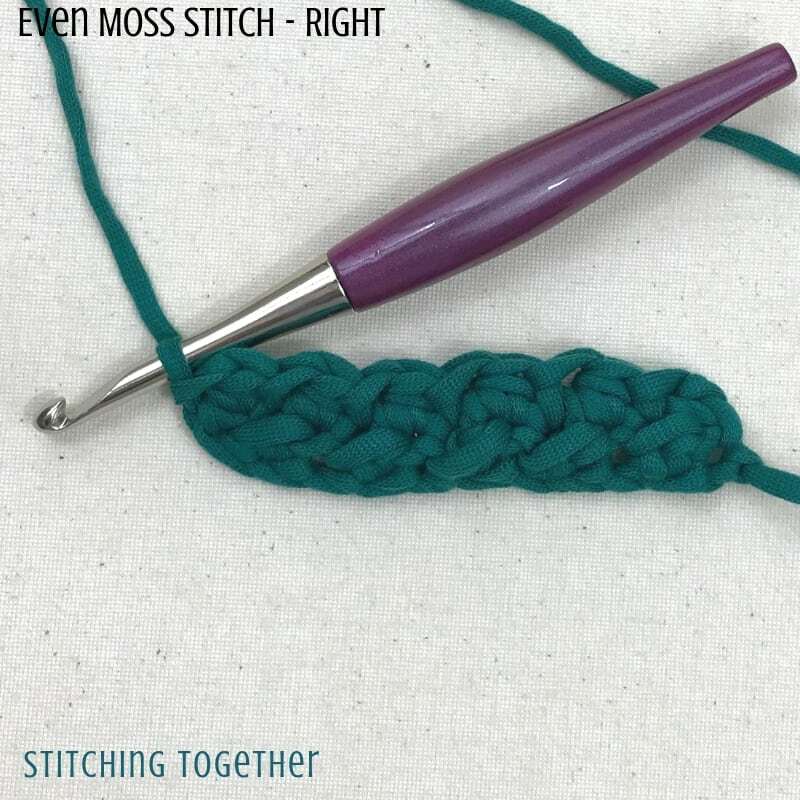 Ready to Learn the Crunch Stitch and the Even Moss Stitch? Once you learn one of them, the other will be a breeze to pick up! 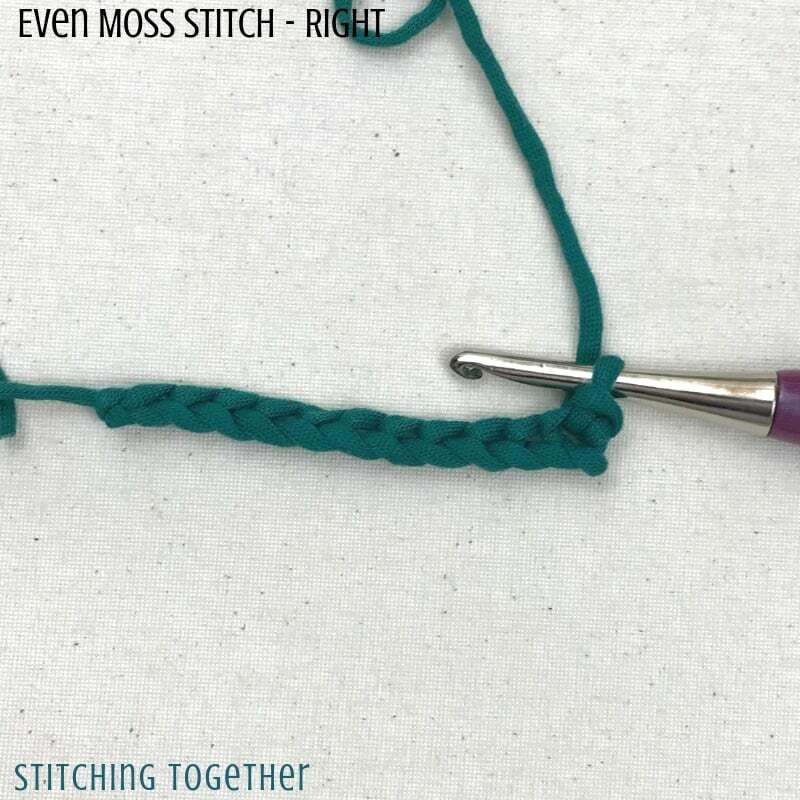 Grab some yarn and a corresponding hook and let’s get started on the Even Moss Stitch and Crunch Stitch crochet tutorials! 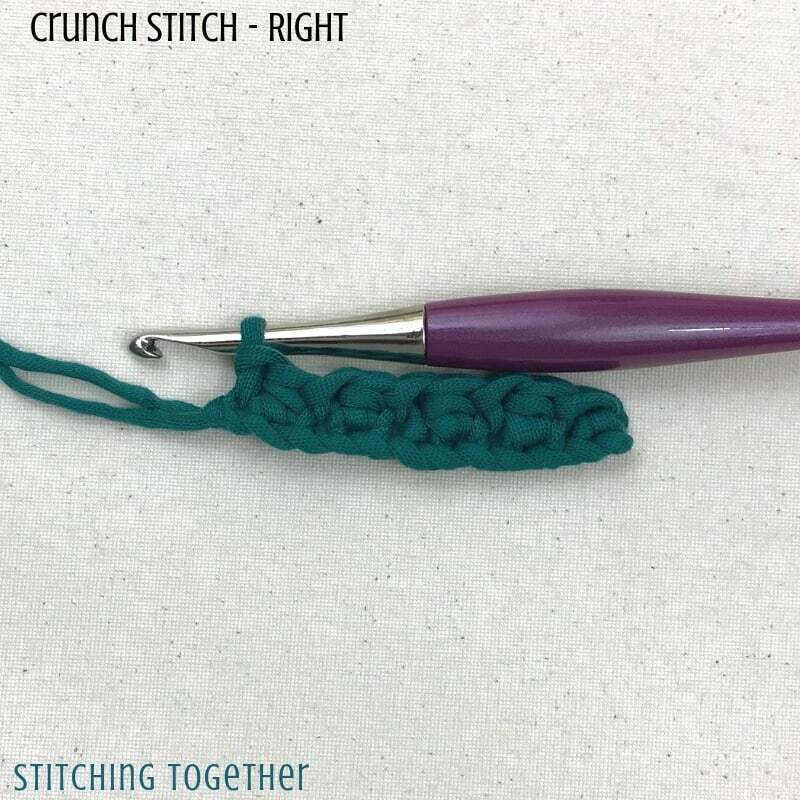 Below you will find the written instructions for the crochet Crunch Stitch followed by the written instructions for the crochet Even Moss Stitch. 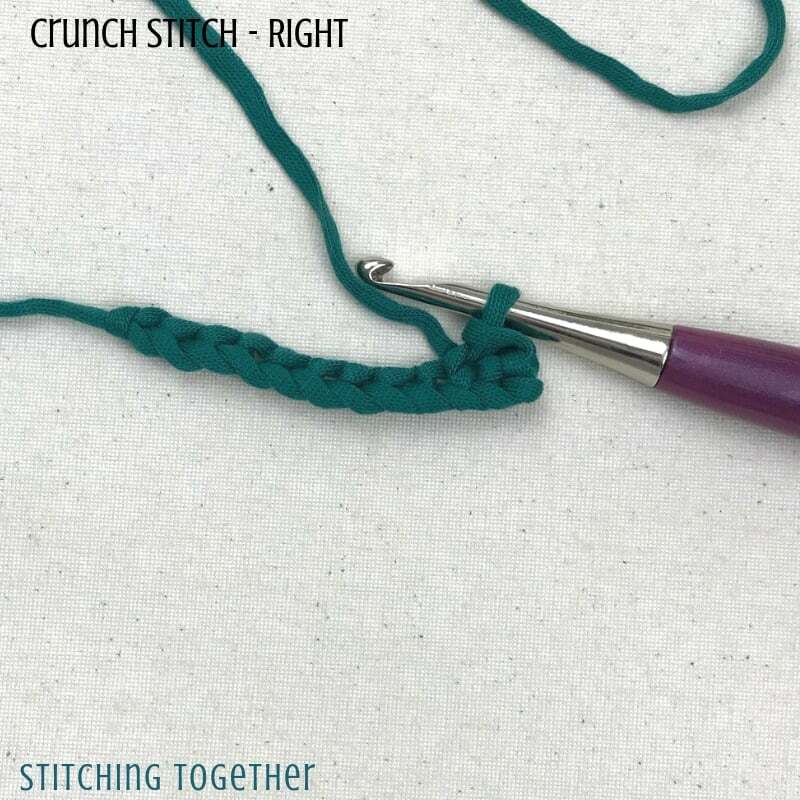 After those, there are step by step photo instructions for both stitches for right handers. I am trying to add left handed pictures as well, but I am having trouble with the pictures! As you work through the photo tutorial you’ll notice the instructions are written out without abbreviations with the abbreviated instructions in parenthesis. The goal there is to help you read patterns if that is an area where you struggle. Sometimes seeing the abbreviated instructions next to the written instructions can help you grasp pattern writing even more. Don’t forget to save this on Pinterest so you can refer back to it! Chain a multiple of 2 + 1. 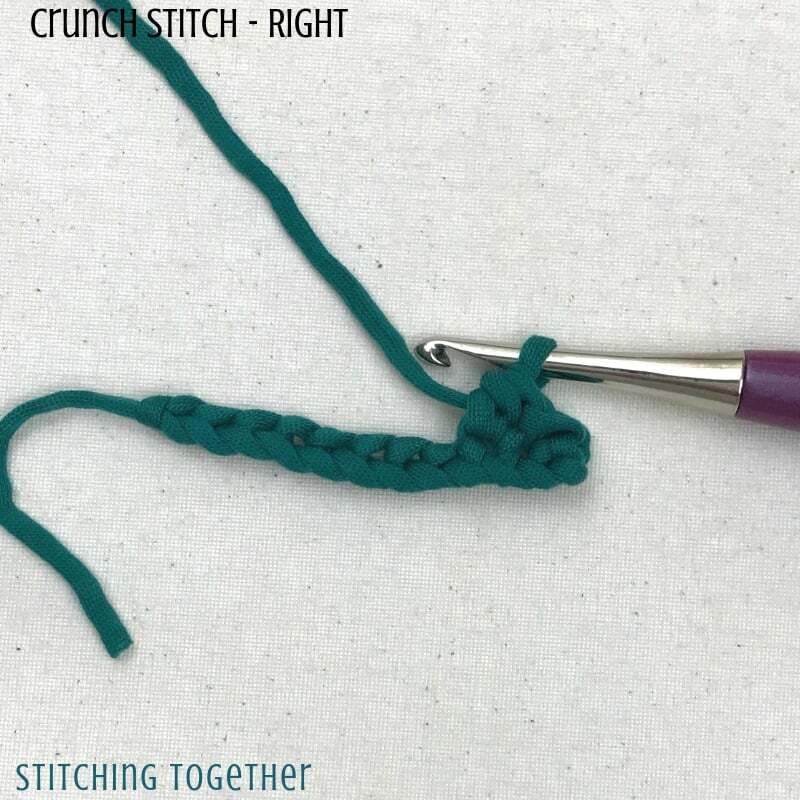 Row 1: Slip stitch into the third chain from the hook, [half double crochet into the next chain, slip stitch into the next ch,] repeat to ending with a slip stitch in the last chain, turn. 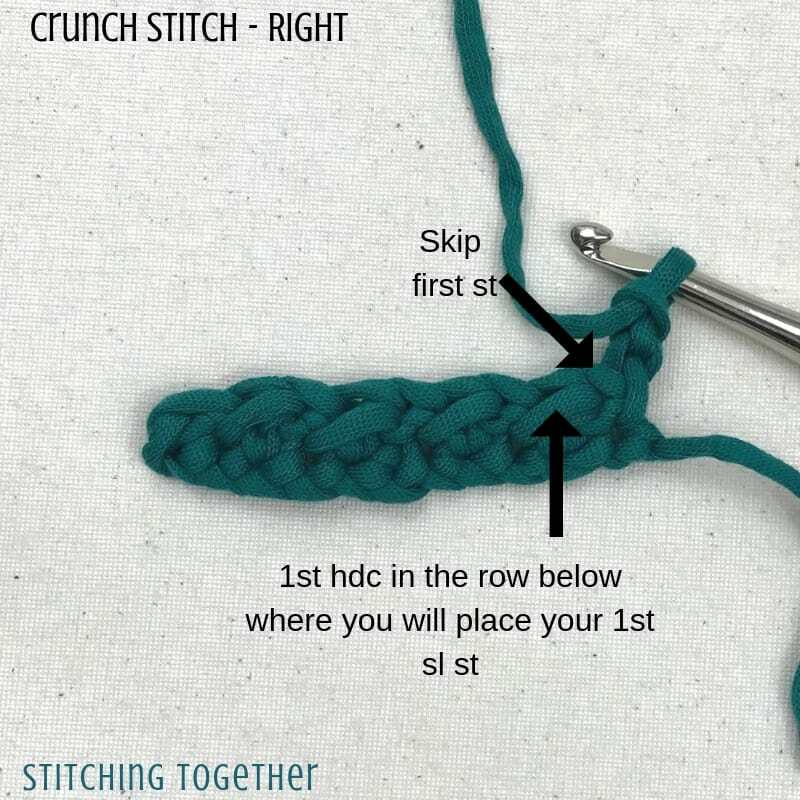 Row 2: chain 2, counts as your first half double crochet, skip the first stitch, [slip stitch into the next stitch (the half double crochet of the row below), half double crochet into the next stitch (the slip stitch of the row below)] repeat ending with a slip stitch in the top of the turning chain, turn. 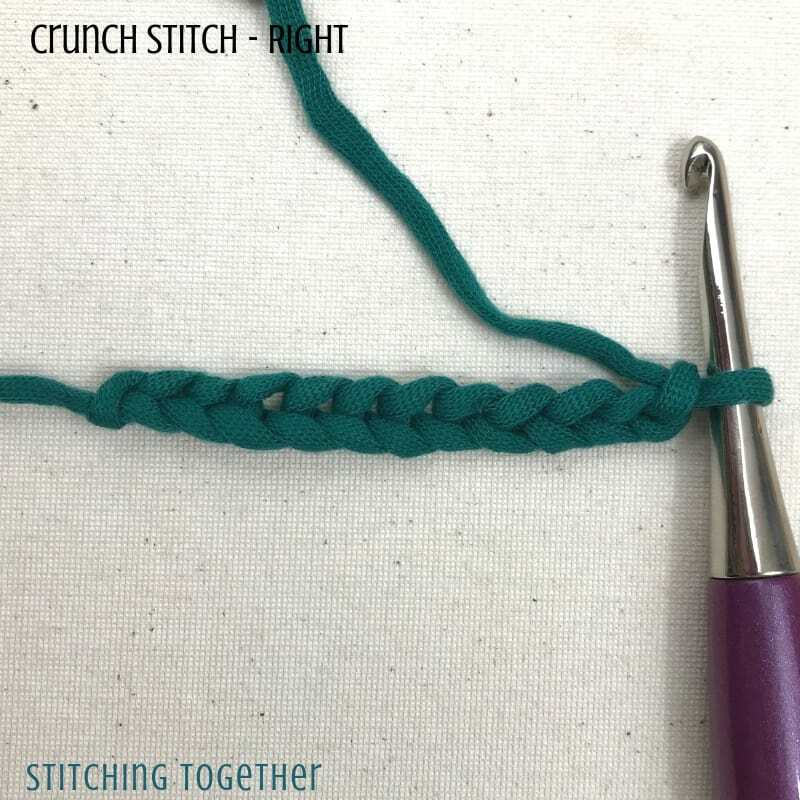 Repeat row 2 to continue the pattern. 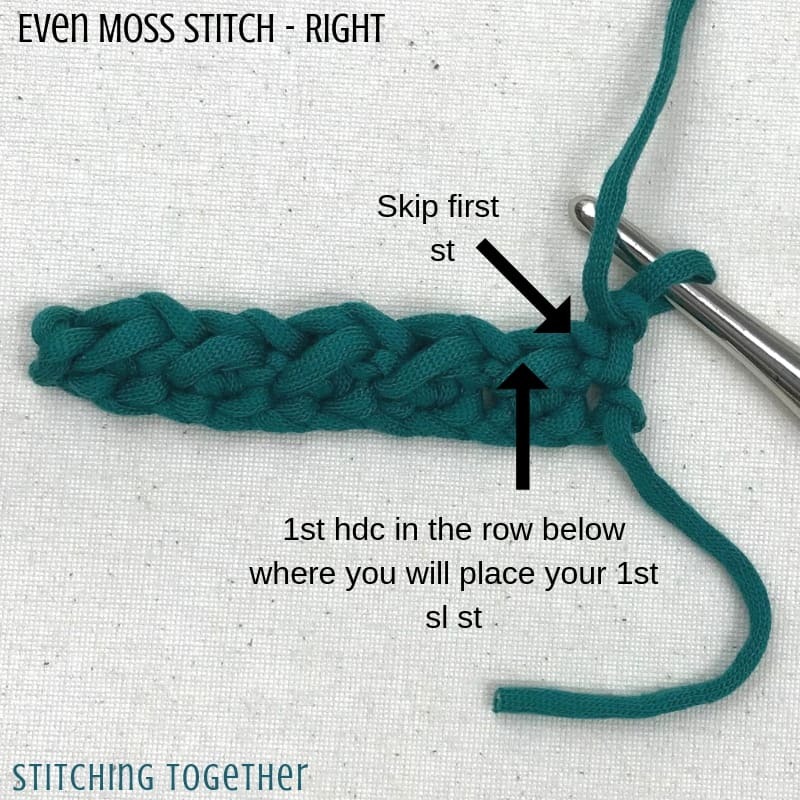 Row 1: Slip stitch into the second chain from the hook, [half double crochet into the next chain, slip stitch into the next ch,] repeat to ending with a slip stitch in the last chain, turn. 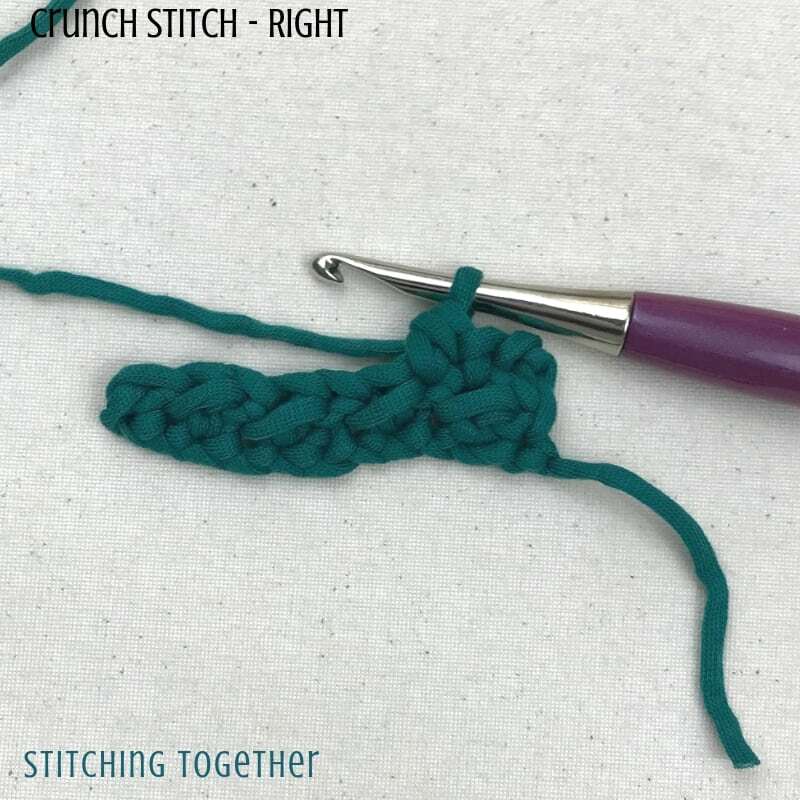 Row 2: chain 1, skip the first stitch, [slip stitch into the next stitch (the half double crochet of the row below), half double crochet into the next stitch (the slip stitch of the row below)] repeat ending with a slip stitch in the turning chain, turn. To continue the pattern, repeat row 2. 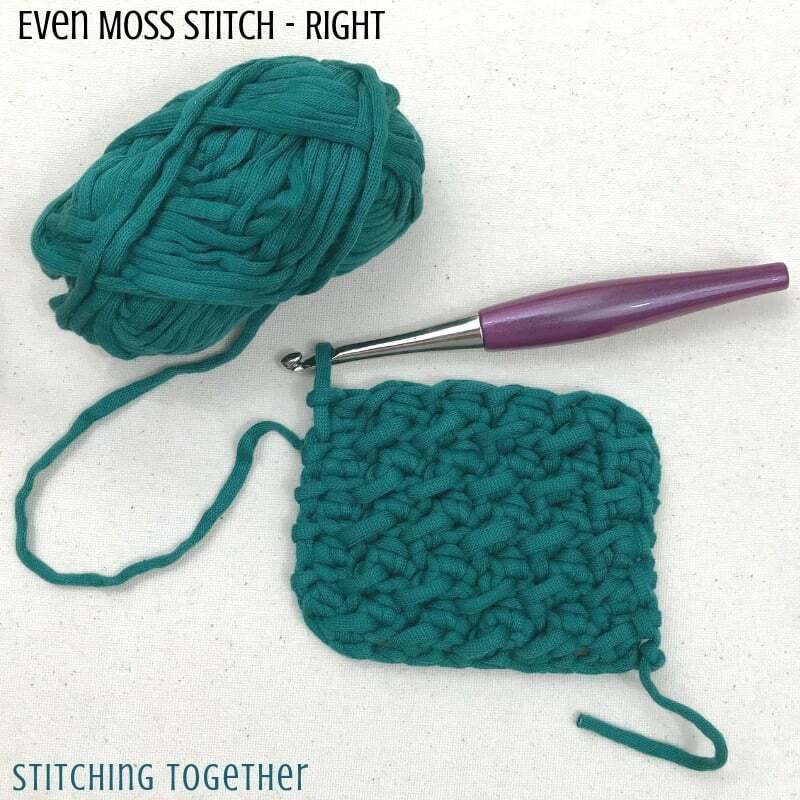 Now that you know how to crochet the Crunch Stitch and how to crochet the Even Moss Stitch, do you have a favorite? 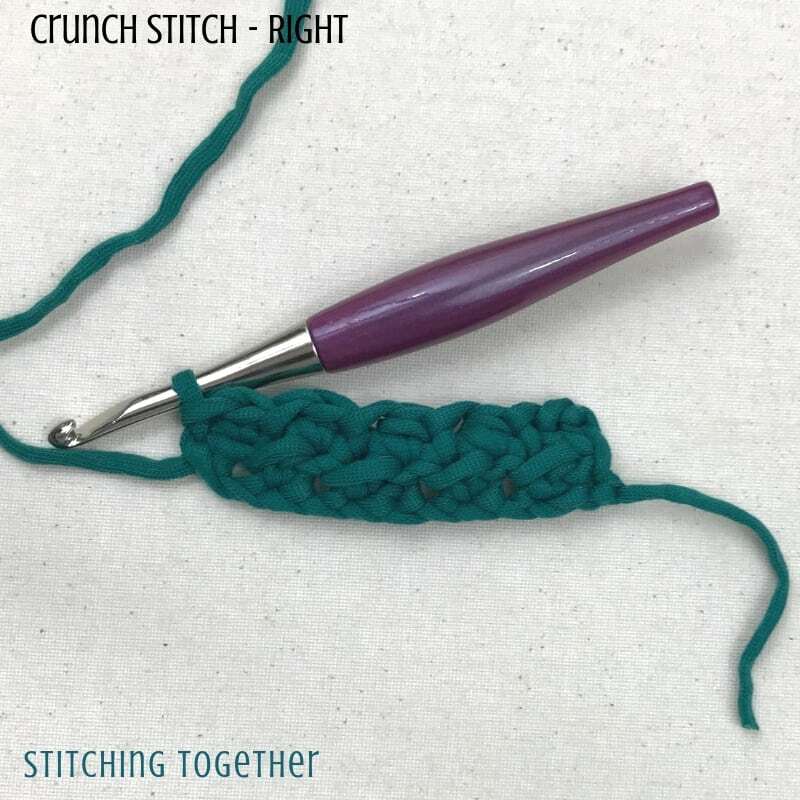 I think I prefer working the Crunch Stitch by just a bit! 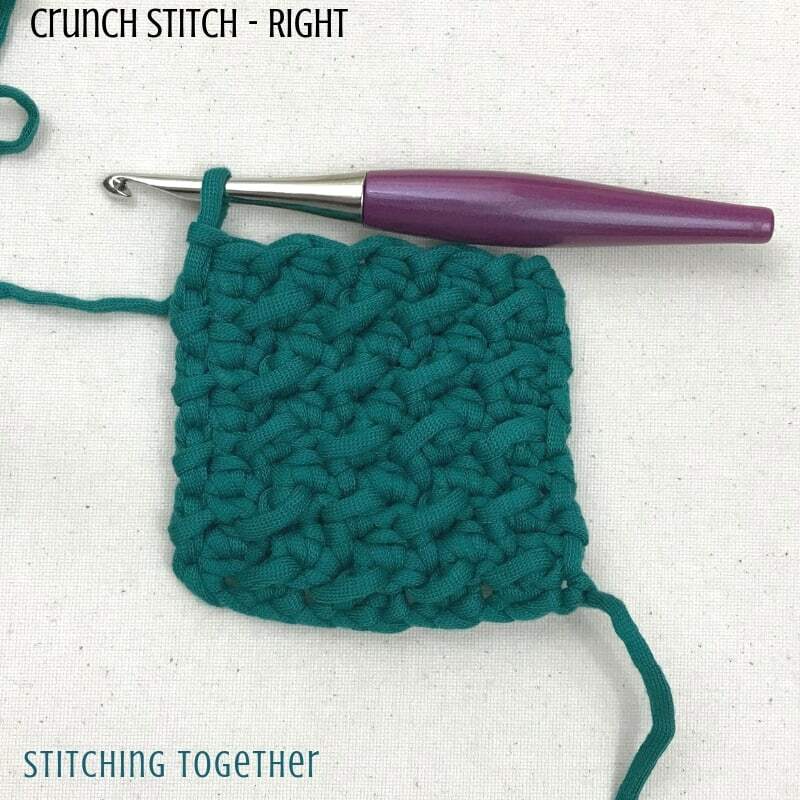 You can practice the Crunch Stitch in the Over the Ridge Crochet Boy Scarf and see the texture pop with the chunky yarn and fun color changes. Thank you ! It’s been a while I’m wonderring what’s the difference between those two stitches. Good explanations. Even for someone who doesn’t speak English very good, it’s clear und understandable. Thanks a lot! Thanks for the encouraging comments Dani!